This is the 33rd GST Council meeting and the first one after the Interim Budget 2019. 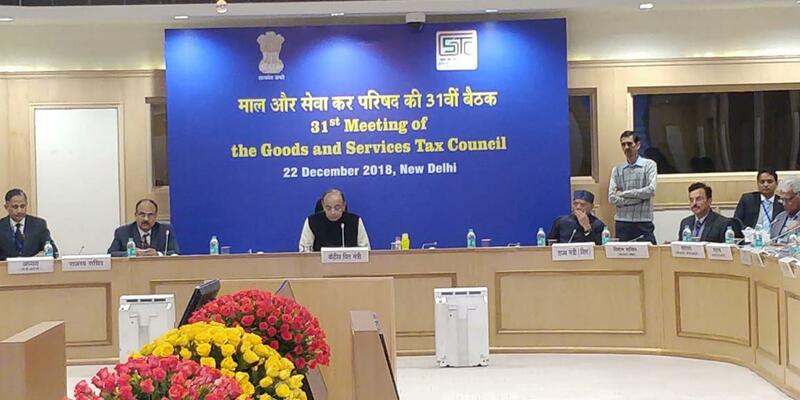 The GST Council met for the 31st time on 22nd December 2018, Saturday at Vigyan Bhavan, New Delhi. It was chaired by the Finance Minister Shri Arun Jaitley. Highlights were Rate tweaks, relief in the form of due date extensions, clarity on GST 2.0 Implementation and streamlining of GST compliance like return filing, registration and refund procedure on the portal. 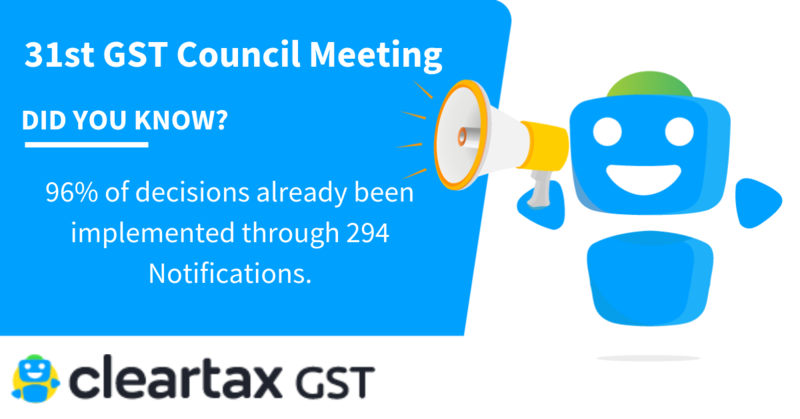 GST council recently had met on 28th September 2018 through video conferencing. 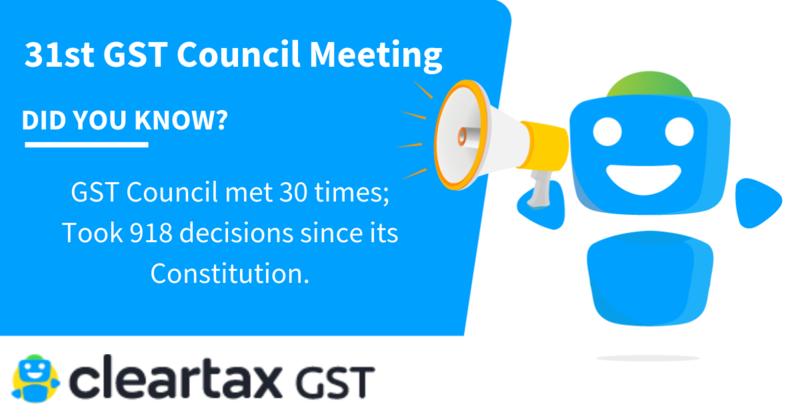 Catch all the 30th GST council meeting highlights. Taxpayers cannot generate e-way bill if they do not file GST returns for two consecutive tax periods*. FM Arun Jaitley has announced a Late fee waiver for all the GST returns yet to be filed as on 22nd December 2018 up to 31st March 2019, for the months July 2017 up to September 2018. Further time to claim the Input tax credit for FY 2017-18 allowed up due date of filing GSTR-3B of March 2019, subject to conditions. There is going to be single tax ledger for each Tax head. For example- The cash ledgers for each tax heads will be merged into one single cash ledger for all tax head such as IGST, SGST/UTGST CGST and Cess. HSN code may be declared only for those inward supplies whose value independently accounts for 10% or more of the total value of inward supplies. If any additional payments are to be made they can be done through the FORM GST DRC-03 in cash. ITC cannot be availed through FORM GSTR-9 and FORM GSTR-9C. Verification by a taxpayer who is uploading the reconciliation statement would also be included in FORM GSTR-9C. The due date for filing of GST Annual Return (GSTR-9) and Reconciliation statement ( GSTR-9C) after GST Audit to be extended till 30th June 2019. GSTR-8 to be filed by e-commerce operators for the period 1st October 2018 to 31st December 2018 will be extended to 31st January 2019. Filing of ITC-04 for the months July 2017 to December 2018 to be extended to 31st March 2019. Council to meet again in January 2019 to decide whether or not to include under Composition scheme: the supply of residential properties under real estate and supply of services by small service providers. A group of ministers(GoM) is to be formed for looking into the same. Today’s GST rates reduction will have an overall impact on revenue of Rs 5500 crore, said Jaitley. Recommendations made by the Fitment committee reports have been taken into consideration in today’s meet. No change in tax rate on Cement: 13 items of automobile parts, 8 items of the cement industry still remain under 28 %GST Slab. Third party insurance lowered to 12 per cent GST Slab from the earlier 18%. 6 goods and 1 service have been removed from the 28 % GST Slab tax bracket under the Good Services Tax (GST) regime. GST for cinema tickets being less than Rs 100 has a reduced tax rate from 18% to 12% GST Slab, for tickets equal to or above Rs 100, GST reduced from 28% to 18%. Lithium-ion batteries charges, video games consoles, small sport related items, accessories for carriages for disabled removed from 28% slab. 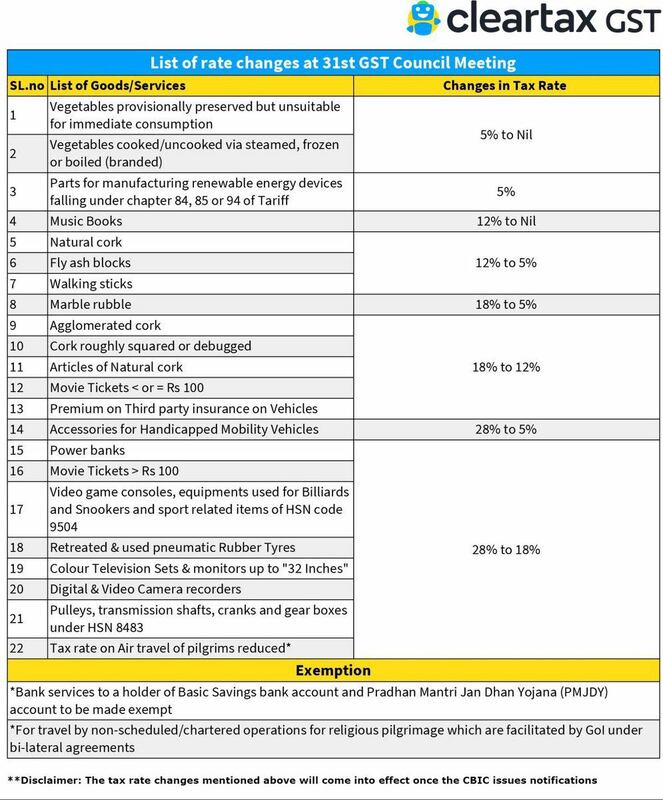 Items claimed to be used by the upper segments such as Air conditioners, dishwashers will remain at 28% GST Slab. Bank charges (savings bank), and Pradhan Mantri Jan Dhan Yojana has been exempted from GST. GST rate on special flights for pilgrims slashed for the economy to 5 per cent and business class to 12 per cent. These include travel by non-scheduled/chartered operations for religious pilgrimage, which is facilitated by GoI under bilateral agreements. The revenue trends, this includes analysing the reasons for structural patterns that affected as revenue collection in some of the States. A 7 Member Group of Ministers (GOM) has been formed to study this. They will be assisted by the National Institute of Public Finance and Planning (NIPFP) who will share the findings with the GOM. Whether or not the tax rates on Lotteries must be 12% and 8% GST Slab on state organised and authorised schemes respectively. Threshold limit of exemption for MSMEs. To extend scope of composition scheme. Creation of Centralised Appellate authority for advance rulings to look into conflicting decisions by two or more state authorities. Section 50 of the CGST Act to be amended: Interest will now be calculated on the Net tax liability arrived after deducting Input tax credit utilised for the month in the electronic cash ledger. A single authority for disbursement of the refund amount sanctioned by either the Centre or the State tax authorities would be implemented on a pilot basis. The details for the same shall be finalized shortly. Documents to be annexed to the form can now be uploaded online. Types of the GST refund that can be applied in this form shall include Excess tax paid, refund by assessment orders, Tax paid on an intra-State supply which is consequently held to be inter-State supply and vice-versa. A detailed procedure is recommended for the same. Window to complete GST migration process is opened till 31st January 2019. Such taxpayers have time till 31st March 2019 to file the GST returns in GSTR-1 and GSTR-3B for the period July 2017 till February 2019. Clarifications for case-specific ITC queries to be issued soon: Complex issues such as refund of ITC accumulated on account of inverted duty structure, the time allowed for availing ITC on invoices, disbursal of refunds within the stipulated time, refund of accumulated ITC of compensation cess, etc, will be clarified promptly. NOTE: *The changes mentioned above will come into effect only once notifed by CBIC/ GSTN updating the portals. Deliberations on announcing GST rates on Petrol and Diesel. Decision to be taken on the reports submitted by the sub-committees formed for analysing GST on Sugar and Cess in case of exigencies. Speculations are high that the council is expected to discuss the proposal in what could effectively slash tax rate from the highest tax slab of 28% to 18%. Goods such as cement, computer monitor and power banks and services like third-party vehicle insurance are going to face rate cuts. The intention seems to be to rationalise GST rates excluding items from the 28 per cent slab and restrict the same to sin goods or luxury goods.